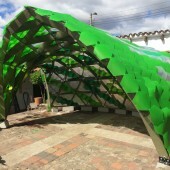 Armadillo is a pavilion designed to provide a covered stage where children and young people studying at Cakike foundation could perform in front of an audience or practice music under a protected outdoor area. Its shell-like-shape comfortably hosts a small group of children and allows a suitable acoustic environment. It opens up towards a semi-circular seating area whilst creating an intimate backdrop, aimed to inspire security and confidence for the performers. The pavilion sits on an existing oval plaza; however, it was designed to be relocated in the future to a similar setting in a nearby property. Hence, the structure is modular and easy to assemble and the foundations are not directly attached to the ground. 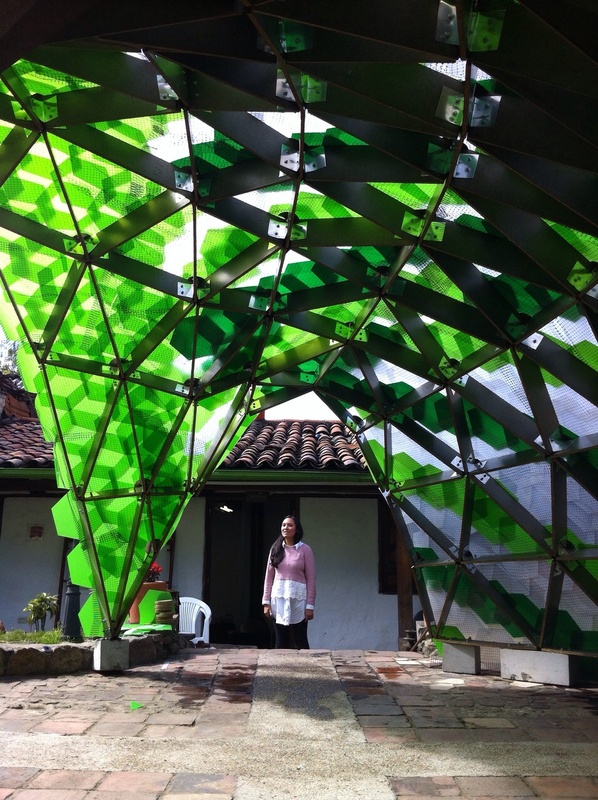 The frame was built using 21 boards of water-resistant chipboard, donated by the company Madecentro. These were cut into small quadrilateral pieces by a CNC machine and preassembled into larger components using aluminium plates. 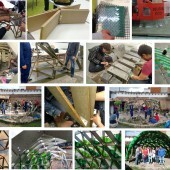 The components were mounted on site onto concrete bases. 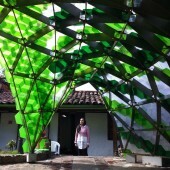 The cover is formed by thin hexagonal plastic tiles attached to a net which is fixed to the structure. 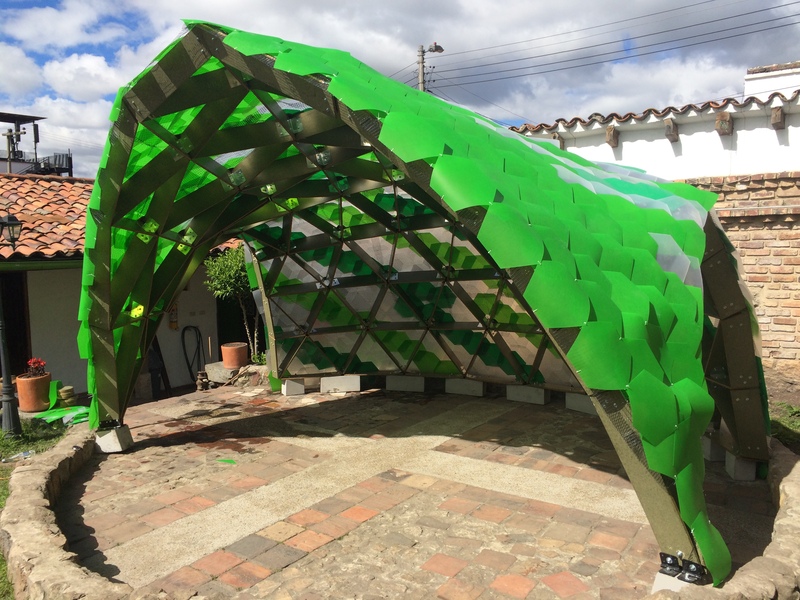 This “live project” is part of a series of academic exercises developed in the Department of Architecture at Andes University, which combine “learning-by-doing” and “action-research” methodologies. These have been devised to promote links between students, educators, researchers, members of the community and the industry, allowing all participants involved to benefit from the experience. Educators and researchers have the opportunity to explore alternative teaching strategies and research ventures. The industry (which partly sponsors the projects) gains new perspectives on the use of their products and the community (which represents the client) obtains a construction to satisfy a need. Above all, the project helps to contextualise students in a “real” situation where they find it necessary to question, reflect, reason and act in response to complex variables. 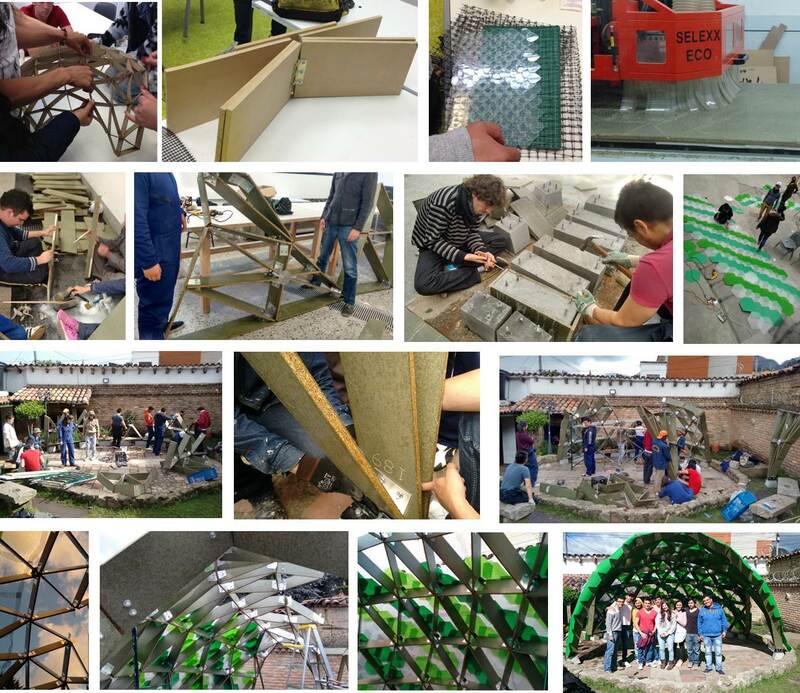 In gives students the chance to connect the formal, functional and technical dimensions of the profession, apply parametric methods for design and manufacturing and work directly with construction materials at 1:1 scale. In addition, it encourages the development of autonomous and collaborative learning by allowing students to strengthen a range of skills, both as individuals and as members of a team. For example, effective visual and verbal communication, the ability to negotiate and deal with conflicts, time and budget management, planning and strategic thinking. This is a non-profit organisation established in 2009 in Colombia to support and encourage children and youngsters in need, through high quality musical projects. Cakike focuses on inspiring students to fulfil their artistic and human potential in an environment of growth and comprehensive training. This as a way to empower and help them to develop solid tools, principles and values for life. Students: Daniela Gómez, Daniel Morales, Joyce van Neiuwerburgh, Manuel Coronado, Alan García, Carlos David López, Pablo Londoño, Laura Martínez, Nestor Penagos, Federico Robinson, Giacobbe Tarquino, Pablo Trujillo, María Fernanda Tuta, Andrés Valenzuela.